When like minds with a shared purpose get together, there is a very real possibility that something beneficial to all will result. Such was the case when Samford University hosted its inaugural Teaching the Christian Intellectual Tradition summer seminar in June of 2015. The seminar on teaching Dante’s Divine Comedy convened 15 scholars from 11 schools that, like Samford, are part of the Lilly Fellows Program network. Two participants were especially taken with a session on how Dante is incorporated into a study abroad course in Italy for students in Samford’s University Fellows honors program. Dordt College professors Walker Reid Cosgrove and Josh Matthews left the seminar eager to develop a study abroad course for students at their school in Iowa. When Samford seminar leaders suggested that the two join the January 2016 trip to Dante’s birth town of Florence, Italy, they gladly accepted. For a week, Cosgrove and Matthews observed the logistics of leading inquisitive college students in an interdisciplinary study abroad experience. From the outset, Cosgrove expected to learn a lot. 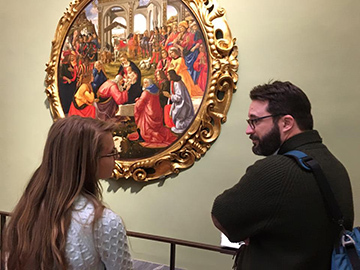 “It was clear about halfway through the first day that we had no idea how helpful it would be,” Cosgrove said of the opportunity in observe firsthand how Samford incorporates the art and architecture of Renaissance Florence into the Fellows’ curriculum. Such knowledge sharing is a good example of how Lilly schools can help each other to enhance the teaching and learning process, says Samford Associate Provost for Academics Chris Metress. “Everything begins with Lilly supporting a Samford initiative. Then, the University Fellows Program builds on the success of that initiative and reaches out to team with other Lilly schools for the Dante seminar, out of which grows our further collaboration with a particular Lilly school, Dordt,” Metress said. The Dante seminar was itself an outgrowth of a Lilly-funded Teaching the Christian Intellectual Tradition conference on St. Augustine that Samford hosted in 2014. That event, which was also held for the first time, drew more than 80 scholars from about 30 universities. Traveling with the 45 Samford Fellows, who take the trip to Florence and other Italian cities in January of their sophomore year, was helpful on many levels, said Cosgrove. To observe how the Samford faculty team plans the itinerary, and puts the sites, art, architecture and streets into conversation with all that the students had learned in the previous three semesters was invaluable, Cosgrove said. Such practical matters as wise hotel selection, knowing how much teaching and viewing the students can take before they burn out for the day, how to handle unexpected student illness and how to improvise are also important. The group encountered such an unexpected event one day when several rooms at the prominent Uffizi museum were closed and the artwork was scattered throughout the large gallery. In addition to Metress and Johnson, the Italy trip is led by classics professor Shannon Flynt and University Fellows Associate Director Caroline Janeway. All four, who specialize in different areas of the humanities, teach University Fellows classes and assist with planning and coordinating the trip. The resulting interdisciplinary dialogue was a bonus for Cosgrove and Matthews, who teach history and English, respectively, and plan to team teach the Dante course and trip. Cosgrove said that he and Matthews have been so inspired by the Lily Fellows Program collaboration that in addition to planning the study trip, they will host a faculty seminar in May on Augustine’s Confessions. As for the Samford team, Metress believes that having the visitors along in Florence helped him to understand more clearly the underlying principles of the course. “Just as teaching something always helps me to understand it better, having the chance to explain our study abroad strategies to Jason and Walker forced me to think more deeply about how Bryan, Shannon and I have developed this course over the years, and how we have incorporated the art and architecture of Renaissance Florence into our Western Intellectual Tradition sequence,” said Metress, who predicts that the Samford course will be even better the next time around. He appreciates the thoughtfulness that Cosgrove and Matthews put into their craft. “Their number one concern was how to develop the best study abroad experience for their students. They care deeply about being effective teachers, and I know they will create an excellent course,” Metress said.